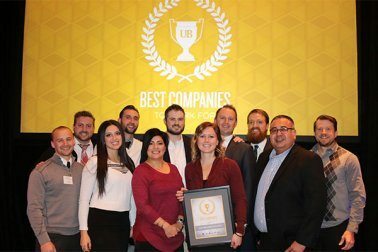 Best Utah Company to Work For Again! Your Employment Solutions was voted one the best companies to work for in Utah! SALT LAKE CITY, UT – January 11, 2016 – Your Employment Solutions, a 20 year leader in the Utah jobs and staffing industry, announced that it has been named a Best Company to Work For by Utah Business for the second year in a row. The workplace culture at Your Employment Solutions is family-centered. YES truly embraces a “work hard, play hard” mindset. Utah Business previously highlighted YES for its fun, friendly work environment. Founded in Utah during 1995, Your Employment Solutions (YES) had a vision to re-create the traditional Utah staffing and employment methods. The owners, Reed Laws and Kerry Westenskow, quickly realized that CUSTOMIZED staffing was nowhere to be found. In order to customize meant every fiber of the company’s existence had to have the ability to adapt and react to each and every client. In addition to customizing, YES has taken this vision one step further by being the first of its kind to certify its staffing process, build its own Utah recruiting job board, and own its criminal background company. For more information, visit YourEmploymentSolutions.com. You can also follow YES on Facebook, Google+, Twitter, and LinkedIn.